Developer Dakko Dakko has released an update to their quirky top-down actioner Scram Kitty and his Buddy on Rails, a.k.a. Scram Kitty DX, in celebration of the 1-year anniversary of the game's original release. This update offers a substantial change to the control scheme, making it easier for the player to engage armies of evil mice. 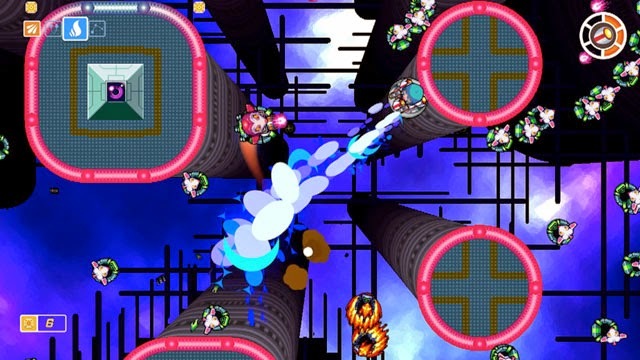 The game has a somewhat odd control scheme where the player navigates environments by hugging the walls, and his aim is locked perpendicularly to his position. This design sometimes makes it difficult for players to line up shots with enemies. However, the new patch allows players to move and fire independently with a more traditional twin stick control scheme. However, players attached to the original control scheme may opt to use it instead.